Here comes to the last Esmeria product review which is Esmeria Organic Soothing Shower Gel for Sensitive & Eczema Skin. It is specially formulated for sensitive and Eczema stricken skin. It soothes hydrates and calms irritated skin with their calming and nourishing blend of Organic Aloe Vera Juice. After a couple of weeks of using Esmeria Organic Soothing Shower Gel, it really do hydrated my skin. It also does more than a mild yet effective cleansing job. Unlike other medicated shower gel, Esmeria Organic Soothing Shower Gel relaxes my minds, pampers and soothers the souls with 100% truly pure essential oils. The texture is in transparent gel form. The bubbles are easily to be formed up when I use it for shower. I like the natural scent of the shower gel. It somehow gives me a relaxing feel when I shower. To all my readers, you can key in “ADELINE” to enjoy a 20% on all Esmeria items. Now is giveaway time! 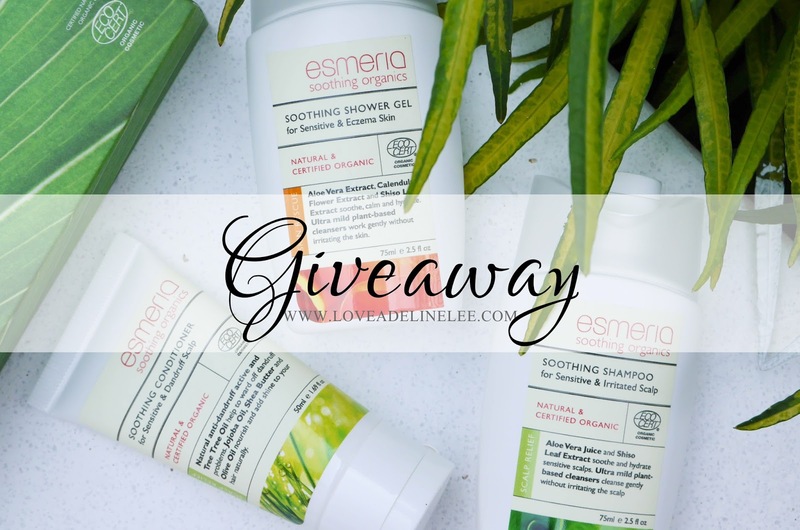 I am giving away a set of Esmeria travel kit inclusive of one Esmeria shower gel, Esmeria shampoo for sensitive & irritated scalp and one Esmeria conditioner. This giveaway is ongoing from 20th October 2015 until 25th October 2015. How to win this? 1. Comment on this post which Esmeria’s products you like and why. 2. Don’t forget to leave your email under your comment. 4. Winner will receive an email notification. Actually, I like all the products of Esmeria Organic because it's organic , natural that suit sensitive skin like me. But to select the product that I think i like the most is Esmeria Organic Soothing Hand & Body Cream because I always need a small size tuve with me the most! I like Esmeria Shampoo gor Sensitive and irritated scalp as it clear off my scalp problem. No more danduff and fallen hair. Thanks to Esmeria, I have heslthy hair. not all hair products suits everyone's head, i have tons of hair products at home cause each one of my family have their own that they could use without causing itch. Having sensitive skin and eczema, I have always search for gentle type of cleansers as most shampoos in the market are either too harsh or will cause dryness. Esmeria's Soothing Shower Gel for eczema and sensitive skin has been my life savior in keeping my skin moist and itch free. I like Esmeria Organic because it made from natural ingredients and suitable for all types of sensitive skin. I like organic soothing shower gel because I have dry skin and I think it can help me to soothe my eczema problem. Eczema skin is my skin I need this!! Can I let other people with Eczema to win this! hehehe Although wanted to try but I think I give more chance to those who have eczema skin! I like organic product as well, good for skin and very moisturize hehe! I love to try Esmeria Organic Soothing Shower Gel for Sensitive & Eczema Skin as i am suffering from eczema these days. good luck to those joining the giveaway! :), cool product review here adeline. 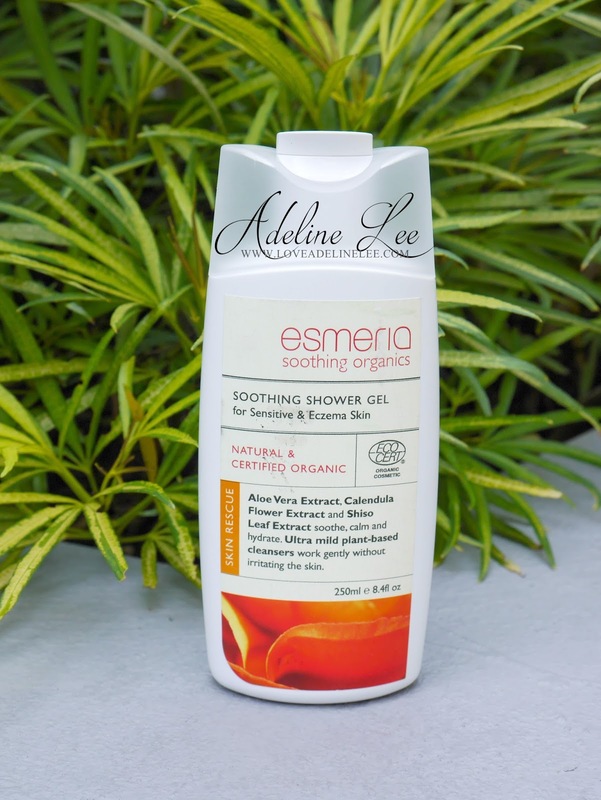 Sometimes I uses organic skincare like Esmeria to cleanse the excess oil, dirt and dry skin. It is suitable for sensitive skin too. I love esmeria product! It feels so organic and great for my sensitive skin! I feel so refreshing after using it! I love shower gels. I prefer using this rather than bath soap. i have never tried this brand yet, but it does look really good and natural. congrats to maple for winning too! Hello my friend! I would like to tell you that this write-up is awesome, great written and include almost all important info. I recently came to know about https://avanaaustralia.com.au/, their Organic Skincare are very effective.